Whereas the first two are simple, direct and emphatic, the third is disconcertingly elaborate. For one, what is the relevance to the content of the pen sketch of Hessel? Practically no-one knows who he is in English-speaking countries so it’s not going to capture people’s attention by making them think, oh look, a book by that guy. Also, what is the point of the French flag? True enough, Hessel is French and was a member of the Resistance and the book deals with France more than other countries, naturally enough. 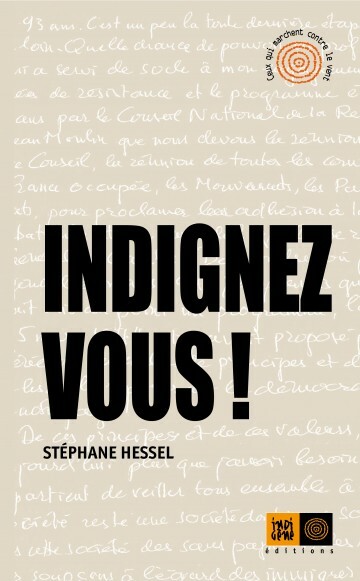 But the addressees of Indignez-Vous! are not specifically French. 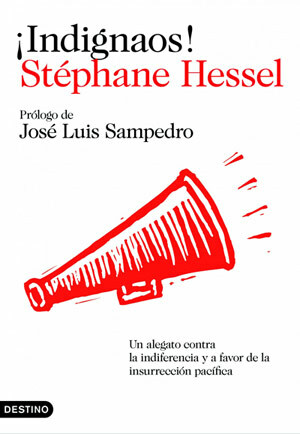 Hessel is at pains to emphasise the universal dimension to his concern (he was one of the drafters of the Universal Declaration of Human Rights) as opposed to the ‘international’ dimension proposed in the drafting of the UDHR by those he describes as ‘our Anglo-American friends’. 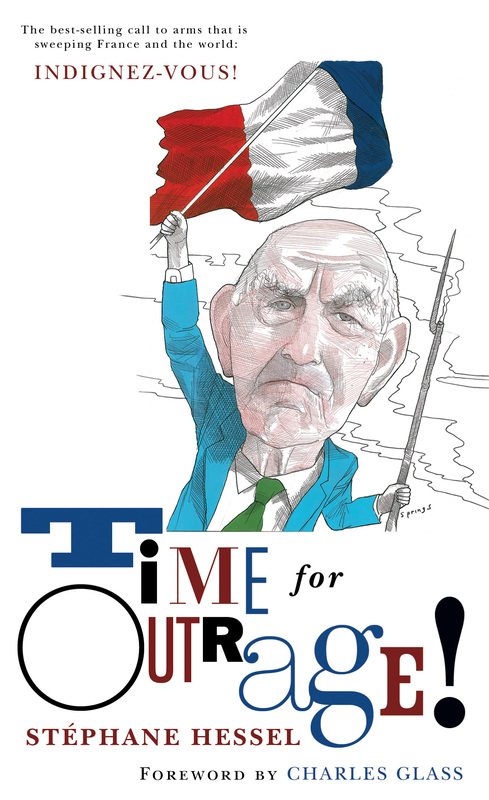 Thus the book is presented to the English-speaking market not as a political text intended to rouse outrage, but as a cultural artefact; a curiosity to be inspected by political anoraks who might take an occasional interest in things going on across the channel. Moreover, by translating the title as ‘Time for Outrage!’, the sense of a text that directly and urgently addresses a collective is lost, and in its stead there is a near parody of a call to arms. ‘Time for Outrage? !’ – under what circumstances would you find yourself shouting that at someone? It sounds like the sort of thing an Oxbridge drinking society might shout in the event of some rotter making off with their crate of Pimms.